Pain is a complex disease: most pain conditions are poorly understood, which means patients don’t receive the optimal treatment. This is why these conditions present a particularly heavy burden for patients, their families and society. Grünenthal is committed to improving the way pain is diagnosed and treated by driving progress in pain research. And, we know it is nearly impossible for one scientist or research team to achieve this on their own. Researchers and experts from across academia and industries worldwide need to join forces to provide better solutions for patients. Therefore, Grünenthal aims to drive innovative solutions for patients through open collaboration. That’s why our experts have developed PainSolve – a new online platform that provides a space for researchers from around the world to join forces and explore innovative solutions for unmet needs in pain. PainSolve is free to join and non-commercial: It aims to connect an international network of experts from across the scientific community to increase the understanding of pain conditions and co-develop solutions through joint projects, approaches and academic studies. Officially launched during the International Association for the Study of Pain (IASP) World Congress in Boston, USA, it’s currently being further developed and will soon include interactive content ranging from blogs and webinars through to forums, surveys, podcasts and more. This year, IASP ran from September 12-16. The bi-annual congress attracts around 8,000 representatives from over 130 countries, including physicians, pharmacists, academics and researchers. IASP 2018 focused on pain education: A range of courses, workshops and presentations offered participants leading insights into the latest developments in diagnosing and treating pain. Against this context, experts from Grünenthal demonstrated PainSolve to participants, expanded their network of professionals and gathered valuable feedback on the new platform that will help us further increase its value for the international research community. Alongside the official launch of PainSolve, Grünenthal presented its approach to innovation in pain management. Its PainWatch concept, for example, is a digital solution aiming to help patients track and manage their pain more effectively. Using a smartphone / smartwatch combination, patients’ various data is collected both via manual entries and objective measure and further analysed to support a better understanding of their specific needs – and improve communication between patients and physicians. Grünenthal also gathered feedback on another pain app being under development, called Recover-E™. It’s a tool for education, documentation and communication that supports patients undergoing elective orthopaedic procedures and that aims to optimise their peri-operative care and pain self-management. 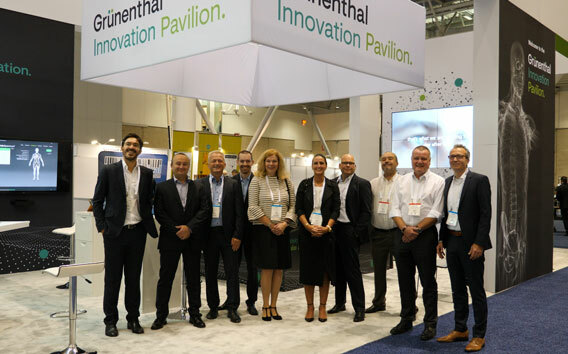 Grünenthal also presented its patient engagement strategies, which implement the company’s commitment to involving patients in every step of its research and development processes by engaging in open dialogue eye-to-eye – as partners seeking a shared goal. Through focus groups, interviews and surveys, our teams listen to patients and patient advocacy groups, and directly utilise their insights to develop truly life-changing treatments. Our team was able to gather valuable feedback from discussions with clinicians and researchers throughout IASP 2018. Their insights will help us refine our commitment to advancing our knowledge about pain and put us in an even stronger position to create solutions that improve patients’ quality of life. We’d like to thank Boston and everyone who joined the World Congress on Pain for an overwhelming experience. We already look forward to picking up the great interactions with researchers, clinicians and patients at www.painsolve.com and jointly addressing the high unmet medical need in pain.